Friday morning I woke up and noticed my eye felt a bit weird and wouldn’t open as wide as it usually does. I looked in the mirror and saw that my left eyelid was drooping and my pupil seemed smaller. I assumed it was a reaction to sleeping terribly all week (or for the past 2 years, really), but then upon discussing with my sister, who had spoken to a physician where she’s working, I started to get concerned it might be something more serious. I learned that drooping eye + constricted pupil are symptoms of something called Horner’s Syndrome. Add this to the ongoing list of Things I now know way too much about that I never cared about knowing. It’s caused by nerve damage, which can be the result of many things, including a tumour in the lung or brain. Sound the alarm bells. Ugh. I really didn’t feel like dealing with more bizarre medical stuff, so I went to work as usual. I contacted my oncologist to see if he thought it was of any concern. He’s usually fairly relaxed about this kind of stuff and takes more of a wait-and-see approach, so I assumed that is what he would say. A couple hours later, while I was eating lunch with my sister, I received an email from a nurse informing me my doctor says I should go to the ER. So I decided what the hell, I’ll spend a couple hours in emerg, they’ll tell me there’s nothing they can do, and I’ll be home before the end of the day. I packed up my stuff and my sister and I walked over to the hospital. And this was the beginning of what I will now fondly refer to as 24 Hours In Hell. I made it through the triage system fairly swiftly and was seen within an hour, which is very speedy in emergency room land. My first interaction was with a nurse practitioner. “Hey, I remember you,” I said, recalling having been seen by this same nurse the last time I was in the ER. “Well yah, I work here,” she shot back, sarcastically. 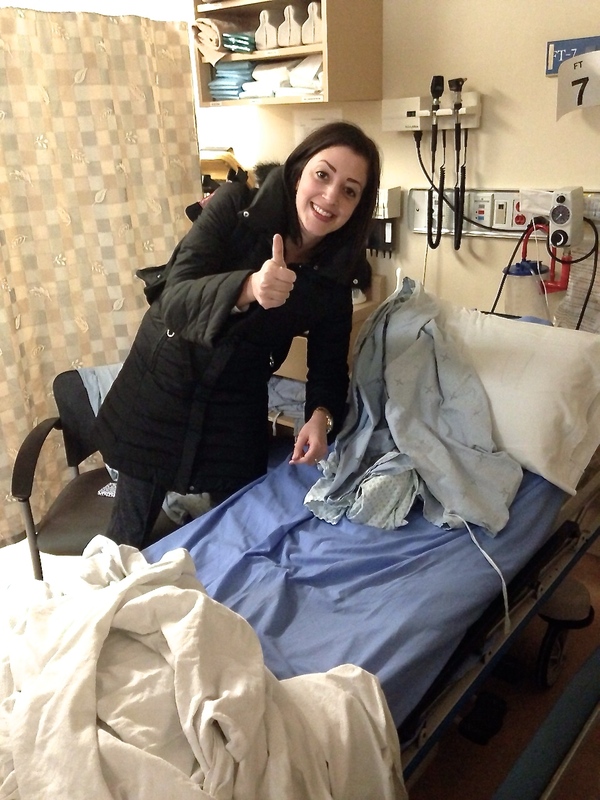 As you may be able to surmise, this gal’s bedside manner was pretty much non-existent. 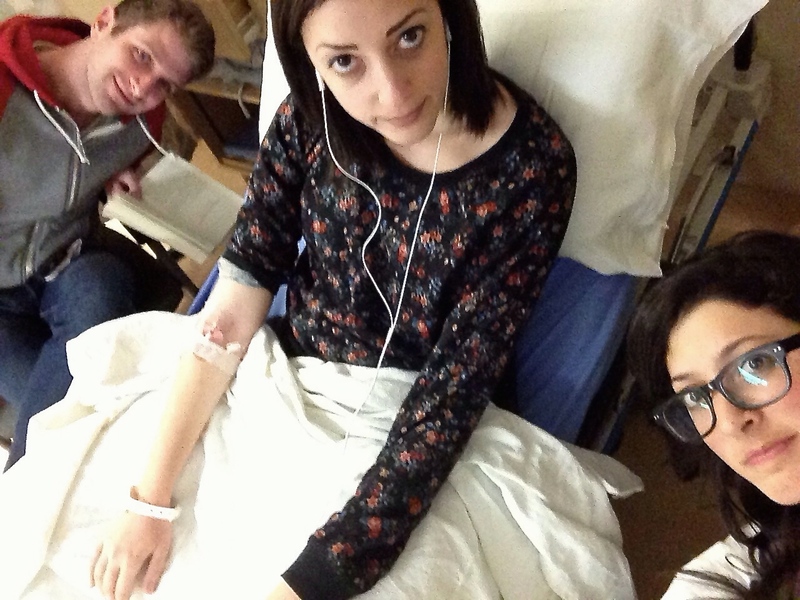 She did some neuro tests on me, following my eyes around and making sure I hadn’t had a stroke and all that jazz. She was cold and had no empathy throughout her questions and examination. She then said she’d have to order a brain CT to rule out anything serious. We asked about doing the lung imaging, due to the relation to Horner’s Syndrome, and she said she had never heard of that and would have to look it up. This did not bring me comfort. I told her I’d prefer not to have a CT as I try to minimize all radiation to my body unless absolutely necessary. She said there would be no way to get an MRI because it takes forever to get one. She went off to talk to the staff doctor and said she’d come find us in a bit. I asked if I was allowed to see a doctor and speak to one myself. She disappeared, and my sister and I were stuck waiting in a couple chairs right in front of the nursing station, as there were no beds or properly designated areas to wait. I sat and watched while a man a few feet away from me was screaming in pain while a doctor performed some kind of procedure, not bothering to draw the curtains. He stared at me the whole time crying in pain. I tried to stare at the floor but it was hard to look away. All over, people were screaming, whining, coughing. Some from prison, many from the streets, a whole hodgepodge of people in agony smushed into a tiny corner of the hospital. We found Mean Nurse and asked her what was going on. This woman was literally casually talking about the possibility of my cancer having migrated to my brain, in the middle of the squishy, crammed hallway, with zero privacy. She may as well have said, “I’m going out to get some groceries” for how little she seemed to care about what she was saying. We pushed again for the MRI, and she said she’d check, looking as though she were doing us a huge favour. We sat around and waited some more. She came back and said she managed to get me an MRI slot and it could take a few hours, and in the meantime, I’d be seen by a neurologist. Ok, so I guess we’re staying here for dinner, I thought. Oh, how naive I was back in those first few hours. We asked Mean Nurse if there was at least anywhere else we could sit and wait where we didn’t have to watch patients bleeding from their head lying a couple feet from us. THANKS FOR YOUR HELP, YOU HAVE BEEN SO KIND AND PATIENT AS I SIT HERE WAITING TO FIND OUT IF I’M DYING. Mean Nurse disappeared once more, and we never saw her again. I didn’t know who I should talk to, where I should go, or what I was supposed to be doing. I eventually found my way over to the chest xray, which took two minutes, and then wandered around asking people where I should get my blood-work done. I found a nurse who said she would take my blood. As has happened to me so many times before, she had problems getting the needle and little catheter tube into my vein and had to press and poke around, causing unnecessary pain. This is when the tears started to come, sitting in another cramped hall while a large man in a bed stared at me. At this point, I was exhausted and starting to get worried, and I needed a good cry. So I let it out, my tears spilling down my face, nose running, red cheeks. Eventually she got the thing to work, took the blood, and then left the tube in to be accessed later for my MRI injection. Because she had put the needle in incorrectly (which I didn’t know at the time), it was difficult to move my arm without pain. I went back to where my sister was waiting, and then my husband came to join us. It was a real party up in there. After some more waiting, a neurology resident came to check me out, doing all the same tests Mean Nurse had done earlier. He wasn’t really able to provide me with any new information or any indication of what they were looking for, but at least he was the first person who wasn’t a complete a-hole. He said the brain MRI was definitely the right test to order (good thing we had to beg for it), and he’d discuss with his staff physician and get back to us. The resident returned and told me that they’d like to admit me for the night, because there were no MRI spots available at that time, so I’d have to go first thing in the morning. “But Mean Nurse told me she had booked me for an MRI and it would happen in a few hours,” I said. I asked if I could go home and sleep and come back in the morning, but he told me that that’s not how it works and if I stay as an inpatient, the process will move much faster. He did not seem to appreciate that suggestion. The resident apologized for the mixup and that I was stuck there and told us to go over to admitting. We wandered over to the admitting desk. “The admitting secretary is on break,” said a woman at the desk. “Do you know when she’ll be back?” we asked. We waited some more. She did not return. We decided to make a quick escape to McDonald’s. I had already eaten a burger and fries that day, but I figured, if I’m going to die soon anyway, I’m going to shove my face with fast food as much as I can. So we sat in McDonald’s, with a blood-filled tube hanging from my arm, eating some nuggets and fries. When we returned to the hospital, the admitting woman was back at her post. We gave her our info for insurance, and she told us we should have a room in an hour or two. 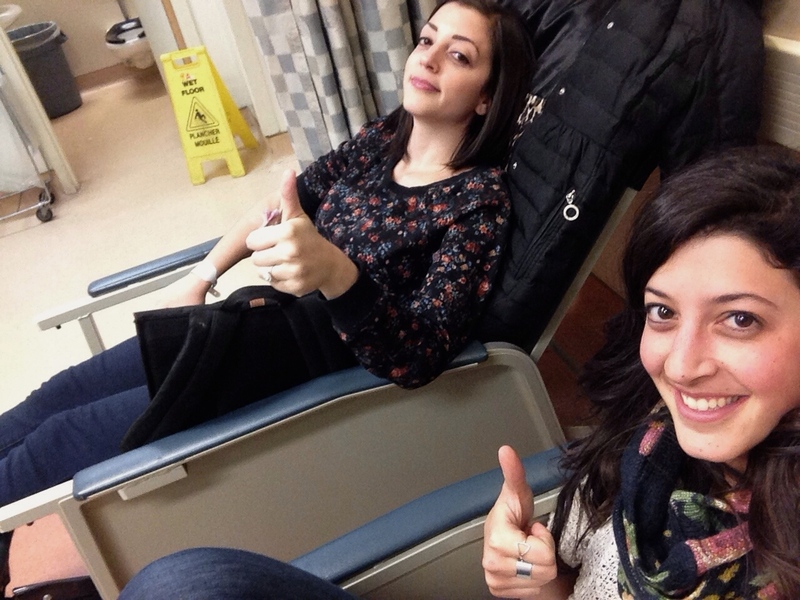 We went around the corner to some old reclining chairs where people get blood drawn and perched there for awhile. The hours continued to pass. We went back to the admitting desk to ask if she could check how long until I could get a bed. She said she wasn’t able to tell us that information, as if we were asking for top-secret super spy information. 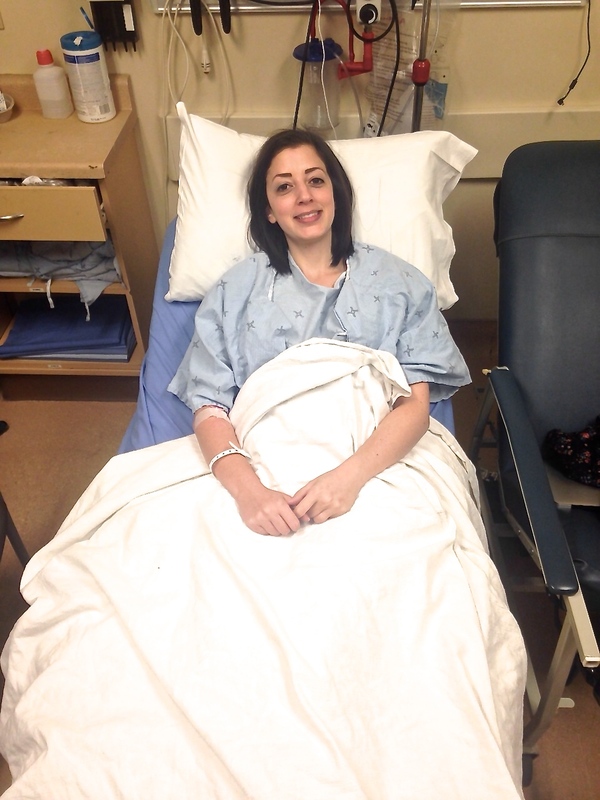 My sister headed up to the neuro floor to see if there was anyone there who could help us out, to no avail. I walked around to suss out the situation and saw a man being questioned by the police, his entire face and body covered in blood. A new nurse appeared for the night shift. We asked him to check in on the room situation, and he was happy to help and made a call. He was the first person who actually smiled and seemed capable of compassion and eager to assist us. He was my angel, in the middle of hell. Nice Nurse told us that I was not getting a room that night. At this point, it was around midnight. Whether the admitting lady had lied to us, or was just clueless, I am not sure. But we were never getting a room. It was all a big lie. I asked him if there was any way I’d get the MRI that night, and he said not likely, as they only keep two slots for emergency MRIs at night and they had to keep them open. “Does a young girl with cancer who might possibly have a brain tumour not count as high on the priority list?” I asked, mostly rhetorically. He smiled. “Fair enough,” he said. Nice Nurse said he would find a bed in the ER for us so I could at least lie down and try to get a few hours of sleep. We returned to our chairs, eating McFlurry sundaes, while the patient behind the curtain in front of us discussed her leaking stomach, and another patient on the other side of the curtain fainted in the bathroom, causing a massive commotion with several people yelling. Finally Nice Nurse returned with the best news I’d heard all day: he had a bed for us down the hall. It was just a skinny ER bed, with a half-broken recliner beside it for my sister, but it was a huge step up and felt like we’d just been given a free night’s stay at the Four Seasons. A place to rest my head and catch some Zzzz’s. Glorious! My husband left for the night to get some rest, and we tucked ourselves in. Unfortunately, on the other side of our curtain, was a very loud family that decided to chit chat and talk loudly on their cell phone all night. I tossed and turned for the next several hours, in and out of a sort of half-sleeping state, waiting for 5AM to roll around. I looked at my watch and noticed it was 6AM. I stumbled out into the hall and over to the nursing station to find Nice Nurse. I went back to my spot and told my sister, and we cursed at our noisy neighbours who were still being noisy. “Your life is hard too,” my sister reminded me. Breakfast came, which included corn flakes and bluberry Greek yogurt. I think that’s pretty much the holy grail of hospital breakfasts, so I was quite happy. Finally a new nurse came by and told me I’d be going up for my MRI shortly and to get in my gown and get ready. WOOHOO! I never thought I’d be so happy to get wheeled into an MRI. It is impossible to look good in these ginormous gowns. Before heading up, the nurse flushed the IV, and it stung like hell. I told her the same thing had happened the night before when it was flushed, but that nurse hadn’t seemed to care. This meant that I had that thing dangling from my arm for approximately 20 hours for absolutely no reason. She took out the old one, and put in a new one, on the first try. She flushed it again, and whaddya know, no burning. This made New Nurse quickly transform into Best Nurse. A porter came and wheeled me up to the MRI, even though I could walk perfectly, but apparently they don’t let you walk. So I decided to pretend I was royalty and lay back and enjoy the ride. The MRI was uneventful, same as the ones I’ve had before. Confined space, loud sounds and vibrations, the usual. After returning to my “bedroom”, a senior resident from Neurology came to speak to me. After going through a bit of my history and what had transpired in the past 24 hours, he asked me if anyone had explained yet why they were doing the tests they were doing and what they were looking for. I told him no one had really talked to me at all this entire time. He told me about Horner’s Syndrome–the first person to mention this since I’d googled it the day before–and the possibility of there being some sort of nerve damage causing it. He said I’d done the right thing going to the ER and it was worth looking into, considering my breast cancer history. I told him I’d been told earlier it could take the entire day to get the results, and he said there was no way it should take that long, and he’d push to get the report and would check in an hour. I told him I’d been teased many times before, with promises like his, and he assured us he would return and wouldn’t up and disappear without telling me what was going on inside my brain. My husband returned and we ate some Tim Horton’s (sidenote: have you tried the new salted caramel timbits? Hella good). More time passed, and our frustration continued to grow as we felt like trapped prisoners with no clue as to when we’d ever be released. The deadline of when Senior Resident said he’d get back to us had come and gone. We asked a nurse to page neurology and she said she would. More time passed, and nothing, and no one. I walked back down the hall towards the nursing station, a zombie with dark circles under my eyes, shoelaces dragging on the floor, greasy hair hanging over my eyes. I found the nurse. “Did you page neurology?” I asked. “Oh, no, sorry, I’ve been really busy but I’ll get to it in a bit,” she said. A handsome doctor was sitting at the desk, on the computer, and asked if he could help me with something. I explained the situation. This was the first medical professional who actually acknowledged how I might be feeling throughout this whole ordeal. He quickly became my hero. He looked at his screen and saw that, indeed, my report was there. He printed it off and went over it with me. No mass found, no metastatic disease or abnormality. Nada. “Oh, that’s good to know!” I exclaimed, but he had to take a phone call. I motioned a thumbs-up to him, and he smiled. I went back to my spot, carrying the report in my hand. 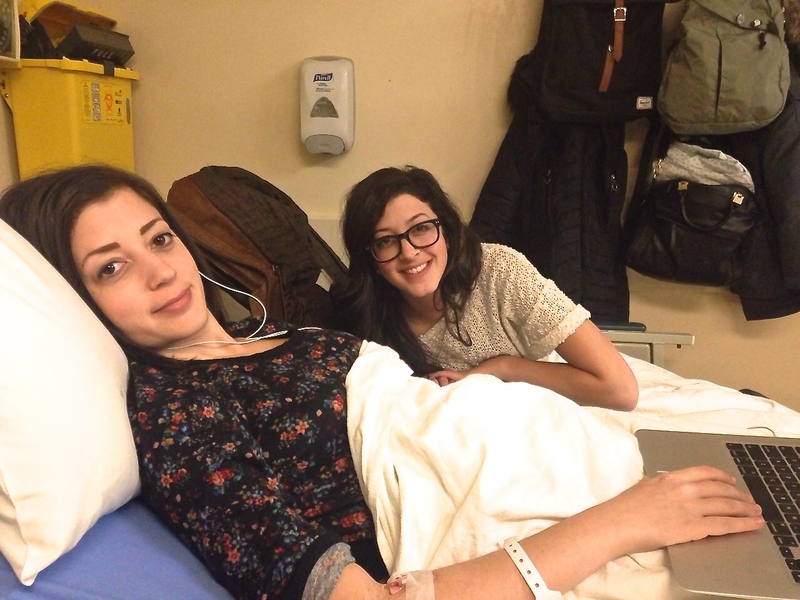 “So I don’t have a brain tumour,” I told my sister and husband. Happiness all around. My sister let out a huge sigh of relief, revealing she had overheard a conversation earlier where one of the emergency doctors expressed concern that there may be a mass in my brain. The Senior Resident returned with discharge papers and I told him I’d already accessed the report through Handsome Doctor. He told me they don’t know what caused my symptoms but they’ll be referring me to a neurologist to see at a later point. We all agreed we were glad there was no tumour pushing on my brain, and I thanked Senior Resident for his help. My husband quickly ushered me out, worried that someone would come back with another reason to hold us hostage for the next several days. We left the hospital and went outside, blinded by the light of the sun. My sister went home on her bike, and my husband and I walked home. I immediately jumped in the shower, not having changed in two days and feeling incredibly grimy. I scrubbed hard to remove the hospital smell and the remnants of the past 24 hours. I lay on the couch, feeling grateful that the entire experience had been nothing more than a very strange and unpleasant day. It is hard to come to terms with the fact that any new medical issue will always be seen in the context of having had cancer, at least for the foreseeable future. I will always have to live with that possibility that the cancer has spread, and a new tumour has found a home in a place I’d rather it not live. I don’t know what caused the eye issues, and I don’t know how long it will be until the next thing pops up that throws everyone into a panic. Hopefully I can get a nice long break after this one.